Lincoln’s Inn Fields is the largest square in London and records exist concerning it from the 14th century when it really was a field – or rather, two – Purse Field and Cup Field. They adjoined the west wall of the grounds of Lincoln’s Inn, one of the four Inns of Court, and were the natural playground for the legal students’ ball games. The survival of this vast open space in the middle of the city, surviving Stuart property developers and massive Victorian road improvements and slum clearance, is due to an early example of NIMBYism. In the Middle Ages, and well into the 17th century, there was nothing resembling a civilized park – the fields were leased out as pasture and, occasionally, used as places of execution. In 1586 the Babington Plot conspirators were hanged, drawn and quartered there, Catholic martyrs were burned in the 1580s and Lord Russell was beheaded in about the centre in 1683 for his involvement in the Rye House Plot. As London expanded outwards developers began to cast an eye over such a tempting expanse of open ground and the first attempt to build a house there was in 1613. This was successfully resisted by the Society of Lincoln’s Inn – lawyers powerful enough to influence the government on the subject. It was clear that improving the open space would assist in preserving this asset, so the Society and the neighboring parishes petitioned Charles I in 1617 that “for their general Commoditie and health [the fields should be] converted into walks after the manner of Morefeildes.” The proposal appealed to the King and the Privy Council supported the scheme “as a means to frustrate the covetous and greedy endeavors of such persons as dailye seeke to fill up that small remainder of Ayre in these parts with unnecessary and unprofitable Buildings.” Resistance to developers seems to be as strong then as it it now. Neither development nor improvement as an ordered public space happened immediately, but in the 1630s the leaseholder of the fields petitioned the King to allow the building of 32 houses. After some wrangling the permission was granted but the developer agreed that the centre of the area was “for ever and hereafter to be open and unbuilt.” The houses were built by 1641 and the area became a fashionable place to live despite the Fields themselves being a dangerous place with fights and robberies (and the odd execution) commonplace. The tall buildings to the right of the print occupy the site of what is now the Royal College of Surgeons which contains the extraordinary Hunterian Museum, a fascinating, if gruesome place to visit for anyone interested in the history of surgery and anatomy. Lincoln’s Inn Fields is included in Walk 7 of Walking Jane Austen’s London (an excellent stocking-filler for any history buff’s Christmas stocking!) As well as the two museums there are still a number of fine 18th century houses and the gardens themselves to enjoy – open to the public since 1894. Today if you want to travel from the middle of London to visit the smart shops of Kensington and Chelsea, or the museums of South Kensington, or go to a concert at the Albert Hall, you will travel along Knightsbridge, the road that stretches for a mile from Hyde Park Corner to the east to the Royal Albert Hall in the west (becoming, these days, Kensington Road and the beginnings of Kensington Gore in the process). Are you in London? Of course you are. When Jane Austen was staying with her brother Henry in his homes in Sloane Street and Hans Place, she was just as clear that Knightsbridge (or Knights Bridge, as it was known almost until the 19th century), was not London. 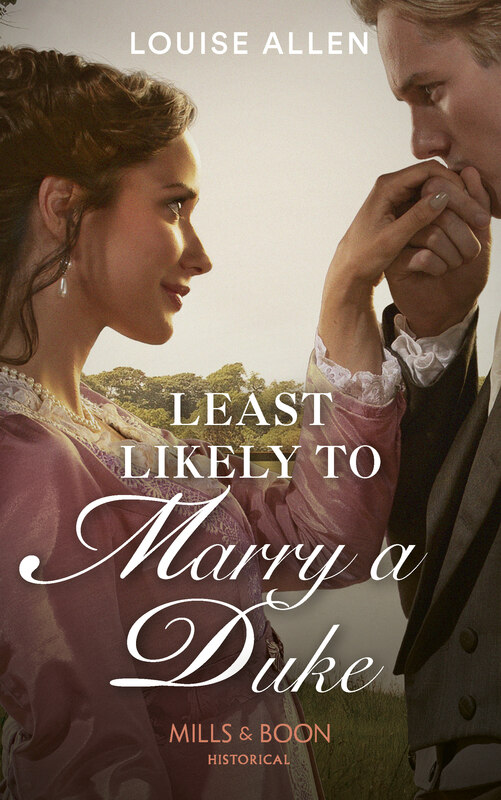 ‘If the Weather permits, Eliza & I walk into London this morng.’ she wrote in April 1809 from 64, Sloane Street. Although the tentacles of development were reaching out from the new Sloane Street, down the Brompton Road and along towards Kensington, London still began at the Hyde Park Turnpike, situated until 1825 just about where Grosvenor Place meets Knightsbridge today. Apsley House, which became the home of the Duke of Wellington, was the first dwelling you came to entering through the gates – Number One, London, in fact. Knights Bridge was never a parish or a manor, only a locality, known from Saxon times as Kyngesburig, or Knightsbrigg. There are many legends about the origins of the name, but none appear to have any basis in fact. The bridge in question crossed the Westbourne River, one of London’s “lost rivers”, as it left Hyde Park, where it had been turned into the Serpentine. The Westbourne ran on south along a meandering course which marks the boundary of Chelsea and St George’s parishes to meet the Thames in the grounds of Chelsea Hospital. It was finally covered over in 1856/7 and became the unromantically-named Ranelagh Sewer and its outfall can still be seen at low tide. The Albert Gate of Hyde Park marks the point where it went under the road and William Street follows its line southwards. If you had ventured this far in the time of the Tudors you would have encountered an appalling road, the “Waye to Reading”, mired so deep in mud that it contributed to the defeat of Sir Thomas Wyatt’s rebel army. They marched against Queen Mary, but arrived so exhausted by the state of the ‘road’ that they were easy prey for the royal troops. Things did not greatly improve for hundreds of years and even as late as 1842 reports were made of pavements ankle-deep in mud. If we are feeling brave we can set out along this perilous mile, guided by the charming little map from Cecil Aldin’s The Romance of the Road (1928). East is at the top and we begin with the Hyde Park Corner tollgate and just before it, at the junction with Grosvenor Place, is St George’s Hospital. That is still there, but is now the Lanesborough Hotel. Behind it was Tattersall’s sale ring until it moved in 1865. More or less opposite was Trinity Chapel which was probably medieval in origin and functioned as a hospital, or lazar house, for the poor. 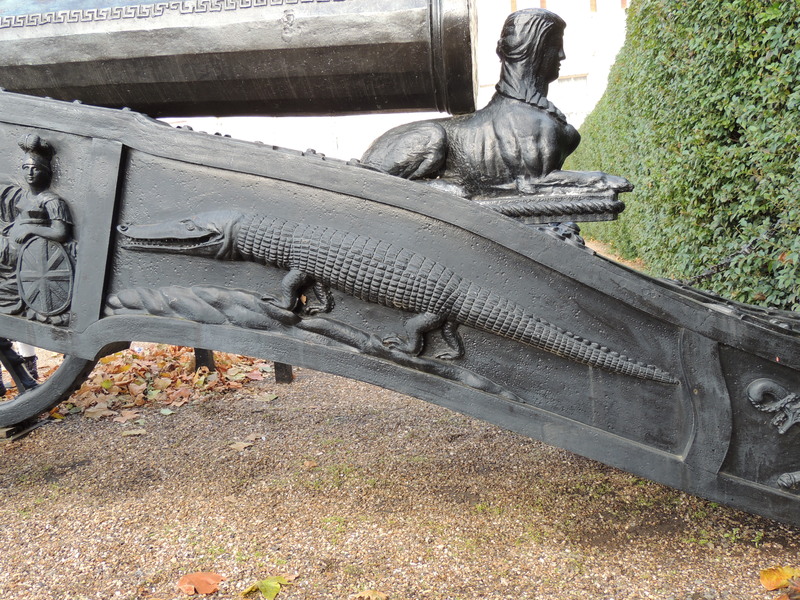 Traditionally it was said to have taken in plague victims in 1665 and the dead were buried opposite under Knightsbridge Green at the present junction of Knightsbridge, Sloane Street and Brompton Road. Eventually the chapel fell into total disrepair and was rebuilt. Its present incarnation is further along the road in Kensington. Now we reach the Albert Gate into Hyde Park, the point where the Westbourne still runs under our feet. On the park side of the bridge was the Fox and Bull Inn (shown as the Fox on Aldin’s map), patronised by artists such as George Morland and Sir Joshua Reynolds, who painted its sign. Less pleasantly it was a receiving house for the Humane Society, founded to assist drowning persons, or deal with their bodies. It was to this inn that the body of Harriet Shelley, the poet’s first wife, was brought after she drowned herself in the Serpentine in 1816. Immediately after the Fox and Bull was the Cannon Brewery, so called from the cannon mounted on its roof. That was surrounded by “low and filthy courts with open cellars” – a far cry from the elegant Kuwaiti and French Embassy buildings which occupy the site now. Almost opposite is the junction with Sloane Street, developed after 1780 along the old track from the King’s Road in Chelsea. Another old road, the Brompton Road, comes in at an angle at the same point and led to the village of Brompton and on to Fulham. At this junction was Knightsbridge Green with a watch house for the constable, a pound for straying livestock, and possibly the site of Trinity Chapel’s plague pit. This was the point where the granite sets that made up the road surface ceased and the mud really began. It is also close to this point that Tattersall’s moved in 1865. Just past the brewery were the barracks for the Horse Guards, giving them direct access into Hyde Park, just as they have today. Originally built in 1794/5 the barracks were rebuilt in 1878/9 and then again in the 20th century, slightly further west on Knightsbridge. From here on there were virtually no buildings on the north side, only the brick wall of Hyde Park. The road now becomes Kensington Road. On the south side of Knightsbridge, following the Brompton Road turning, were the Rose and Crown (the oldest of Knightsbridge’s inns, shown below) and the Old King’s Head and then the floor-cloth manufactory of Messrs. Smith and Barber. It had been established in 1754 and lasted well into the Victorian era. Then came three mansions that were, when they were built, true “country houses”. The first was Rutland House, the next Kent House, home for a while of the Duke of Kent, Queen Victoria’s father, and then Kingston House. Kingston House was built in 1769 for the scandalous Elizabeth Chudleigh whose story is so amazing that I will save it for another post. She died in 1796 and it later became the home of the Marquis of Wellesley who died there in 1842. He was the elder brother of the Duke of Wellington. An area of nursery gardens followed on the south side of the road, part of the great expanse of fruit and vegetable-producing land that surrounded London. Somewhere along this stretch we enter what is now known as Kensington Gore – nothing to do with blood, but named after Gore House which stood on the site of the Royal Albert Hall. It was built in the 1750s, decorated by Robert Adam and was the home in the 1780s of Admiral Lord Rodney. It was acquired in 1808 by William Wilberforce, the great campaigner for the abolition of the slave trade, who lived there until 1821. Opposite Gore House, a most insalubrious neighbour for a fine mansion, was the Halfway House Inn (shown above). This was where the spies for the highwaymen of Hounslow Heath would congregate to see who was travelling and pass the word on to alert the highwaymen about fine carriages or vulnerable riders. Just beyond it on the park side was the first milestone from the Hyde Park turnpike, the point where we can leave the dangers of Knightsbridge behind us and enter the village of Kensington with a sigh of relief for our arrival safe from the mud and the footpads. Everyone has heard of the Thames Frost Fairs where the river froze solid and Londoners could walk across, drive across – and on one notable occasion in 1814, lead an elephant across. The first recorded frost fair was in 1608, the last in 1814, after which warmer winters changes in the river’s flow because of alterations to the bridges prevented it ever being possible again. Below is a detail from Luke Clennel’s picture of that last fair. But the Thames did not freeze every year, even before 1814, and when it did the ice was covered in booths and stalls. More reliably Londoners could take to the frozen ponds and lakes in their parks and skate. Below is a detail from an original pen and ink sketch by George Morland in my own collection and you can see the simple skates laced onto the boots or shoes of the skaters. ‘In severe winters, when the Serpentine River is frozen over, the ice is almost covered with people. One winter there were counted more than 6000 people at one time on the ice. A number of booths were pitched for the refreshment of the populace; and here and there was a group of six, eight or more, fashionable young men, skating, and describing very difficult figures, in the manner of a country dance, with particular neatness and facility of execution. In general, however, the English do not excel in this very exhilarating and wholesome exercise. The lake in St James’s Park was also a good size for skaters as this detail from an undated print shows. Some skaters are obviously far better than others! The building on the far bank is the Queen’s House – Buckingham House – which eventually became Buckingham Palace. Finally here is the image I am using for my Christmas card this year. The lady in her gorgeously warm-looking crimson pelisse seems very snug as she watches the skaters, especially the gentleman with his frozen fingers tucked into his armpits! Her rather bizarre hat is decorated with holly and there is a full description of her outfit at the end of this post. A Very Merry Christmas and Happy 2016 to all my readers! laced with black, and lined with fur, complete the dress. One of the emptiest, yet most evocative, spaces in London is Horse Guards Parade. In my last post I wrote about the Regent’s Bomb – the fantastical mortar and gun carriage that sits on one side of the Arch. 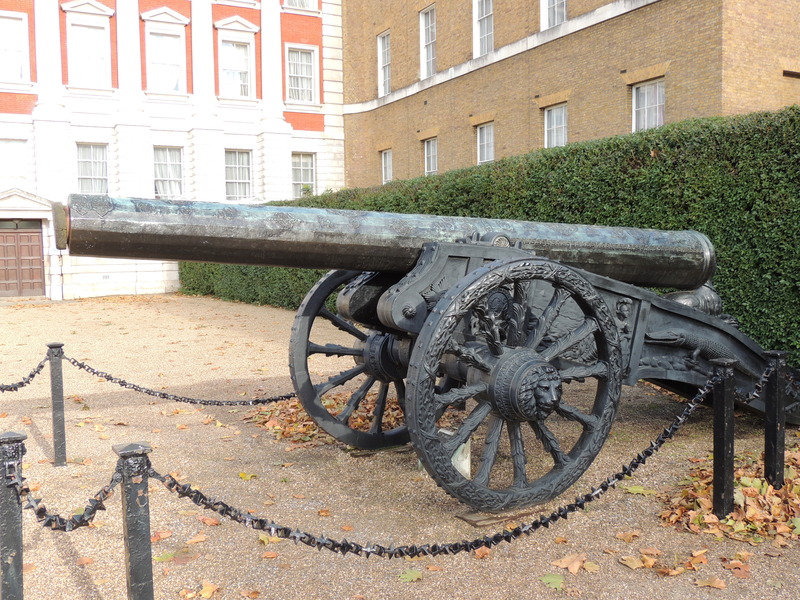 This time I’m writing about a little of the history of the parade ground and another cannon with a wonderful gun carriage. Horse Guards Parade sits between Whitehall and St James’s Park and began life as open land next to the grounds of York Place, the London palace of the Archbishops of York. Its main entrance faced down the road that is now Horse Guards Avenue, the bishop’s route to his landing stage on the river. With the fall of Cardinal Wolsey Henry VIII seized York Place and then set about acquiring “…all the medowes about saynt James, and all the whole house of S.James and ther made a fayre manision and a parke…” according to Edward Hall. When the king began his work on what was to become Whitehall Palace a willow marsh for the farming of osiers for basketwork, Steynour’s Croft, covered much of what is now Horse Guards, the Bell Inn stood at the southern edge and an old track crossed it from the scrubland that became St James’s Park. By 1534 the Palace of Whitehall was largely complete. Part of the area, a longitudinal strip running west across Horse Guards became his tiltyard, scene of tournaments and knightly exercises. Under Elizabeth I the Tiltyard was used for animal baiting and tournaments and pageants which were set pieces for state occasions. Under James I elaborate masques were held – including one involving an elephant carrying a castle – but the increasingly theatrical nature of royal masques led to the building of the Banqueting House on the other side of what was then King Street (now Whitehall) and the last masque in the tiltyard was planned for 1624. After that it became known as the Bearstake Gallery and it continued to be used for baiting sports until 1660. A standing guard was stationed in a specially built guardroom at the tiltyard from 1641 and the area continued to house soldiers throughout the Commonwealth period. On May 8th 1660 Charles II was proclaimed on the site of the old Tiltyard ‘Green’ and the renovation of Whitehall Palace began. A plan of c1670 shows Whitehall as a wide street coming down from the north and ending at the pinch-point of a Tudor gate. The range of buildings that were the old Horse Guards were built in 1663 with a yard in front and behind the range the open expanse of ground that became Horse Guards Parade. The king moved to St James’s Palace, across the park, and Whitehall became the location for many government offices and from the 1730s the buildings surrounding Horse Guards were gradually replaced. The dilapidated old building was demolished in 1750 and the new building – the one we see now – was designed by William Kent, with additions by Isaac Ware. 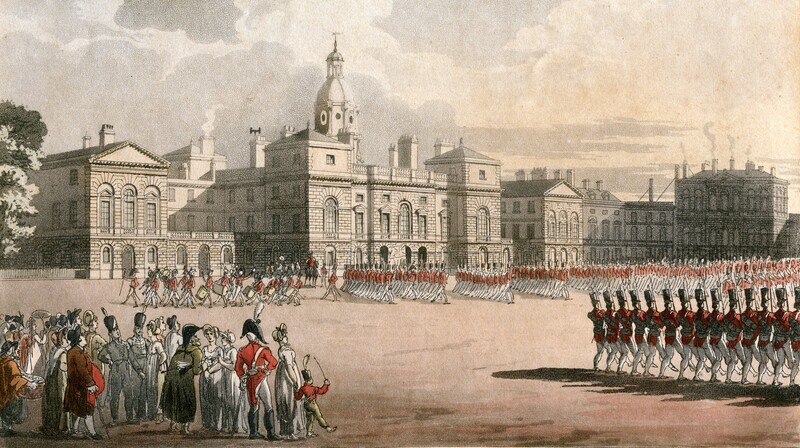 The large open space was referred to as the Parade ground, but the first written reference to “Horse Guards Parade” as a title comes as late as 1817. By then the area looked much as it does today as can be seen in this print of 1809 by Rowlandson and Pugin, published by Ackermann. Only the high brick wall that closes off the gardens at the rear of Downing Street today (to the right of the picture) is missing. and Walking Jane Austen’s London (Walk 6 Westminster to Charing Cross, which goes through St James’s Park). Horse Guards’ Parade lies between St James’ Park and Whitehall and has many historical connections – it was Henry VIII’s tiltyard for the Palace of Whitehall, it was the only open place in London big enough for the funeral procession of the Duke of Wellington to form up in, it is the location for today’s Trooping the Colour ceremony – and it was even the location for the beach volleyball in the 2012 Olympics. 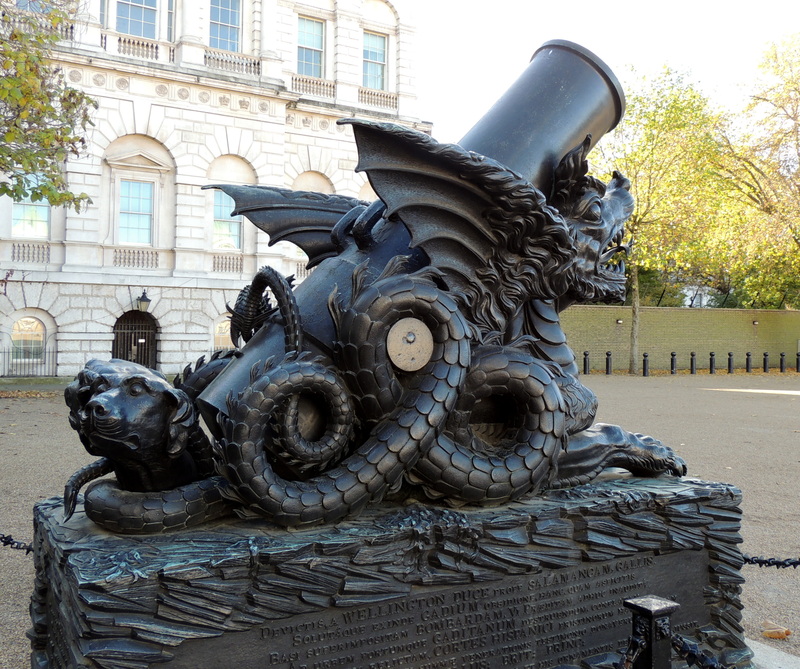 The plain and simple mortar was sent to Woolwich Arsenal and there a support and plinth was made for it in the shape of a dragon. It is a truly stupendous and bizarre construction and was unveiled, with great ceremony, on the 12th August 1816, the Prince’s birthday. Immediately it attracted ridicule, for not only was the design completely over the top, as only something designed to appeal to the Prince of Wales’s taste could be, but “Bomb” sounded irresistibly like “Bum” and the Regent’s substantial backside was already the subject of many coarse caricatures. Being uncovered, in St. James’s Park, on Monday, the 12th of August, 1816, His Royal Highness’s Birth-Day. And celebrate the Regent’s bomb! Thou fill’st my every sense with rapture! And aid me sing this mighty Bomb! Became, at length, a Bomb Imperial! Oh, what a Bomb! Oh, Heaven defend us! The thought of Bombs is quite tremendous! To gaze on its amazing bore! To worship Bomb so truly royal! And humbly kiss the royal Bomb! And in the touch-hole shove his nose! Such Bomb was never seen before! And boast thy glorious Regent’s name! As far t’outrival fam’d St. Jago! 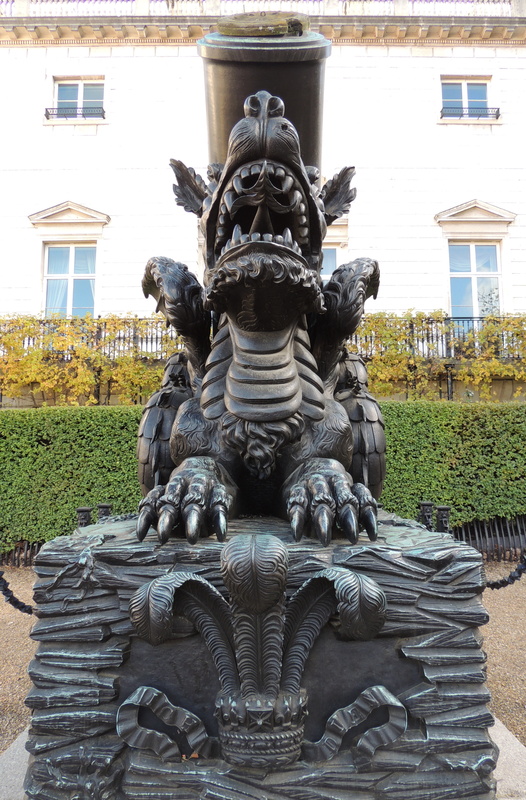 “Bombastes” might have been surprised to discover that two hundred years later folks still come “and contemplate the Regent’s Bomb!” You’ll find the Prince’s Bomb on Walk 6 in my Walking Jane Austen’s London.